APS (Active Pixel Sensor) technology has been developed in the last decade, largely benefiting from the constantly progressing CMOS technology. Several advantages over CCD technology include: lower cost, lower power consumption (up to 100 times), higher dynamic range, higher blooming threshold, individual pixel readout, single low voltage operation, high speed, large array sizes, radiation hardness capabilities, random access, possibility to develop separately the "photon sensitive part" and the "signal conditioning part" and last but not least the possibility to integrate "intelligence" at the sensor level (so called SoC, "System on Chip"). The radiometric performances of APS are still not able to compete with the best CCDs available presently on the market for space application but the gap is thinner and thinner. As far as spectral response is concerned, the UV range is only at the exploration phase, with the application of CCDs "recipes" like specific coating deposition. Backside illumination technology, already applied to CCDs, is one way to extend the spectral coverage of APS. Another very promising alternative is the hybridation of the readout architecture to specific substrate with targeted optical properties (such as Wide Band gap semiconductors), with the possibility as stated earlier, to optimize them separately. A 2048 x 2048 Active Pixel Sensor with improved radiometric performances for the visible imagers of the Bepi Colombo MPO (Magnetospheric Planetary Orbiter). The extension toward UV by suitable techniques should also profit to the Solar Orbiter imaging payload. A 256 x 256 focal plane array based on APS for the NIR (0.5 to 2.5 μm) for the Bepi Colombo Near Infrared Imaging spectrometer. The use of HgCdTe substrate is a very strong option. 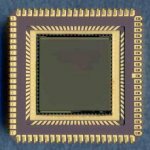 Star1000 chip - a 1000 x1000 pixel chip has a 15 um pixel size. The test bench will operate typically from 300 nm up to 2 μm.